Officially, 49 people have died in the aftermath of Hurricane Maria. But hundreds have died and will die as a result of racist capitalism. The pharmaceutical factories are intact, but the homes of the workers are destroyed. 85% of the island is without electricity. Nearly half of the people are without running water. They are drinking from contaminated springs and rivers and even hazardous waste sites. Hospitals are closed or barely functioning. Food is scarce. Roads are blocked. Thousands of workers are out of a job. Meanwhile, Trump—putting Wall Street investors first as usual—has added racist insult to injury, complaining that Puerto Ricans “want everything to be done for them,” and tweeted that the debt and rotten infrastructure “was of their own making.” The Democrats and the Puerto Rican politicians are just as responsible for this imperialist disaster. This is a crisis of capitalism. Workers in Puerto Rico have united to clean streets, repair homes, and share electricity. Villagers whose bridges are washed out have joined together to build pulley systems to bring in needed supplies. Volunteers from the mainland have gone to provide emergency relief. The spontaneous working-class solidarity we’ve seen in PR, as in all the recent “natural disasters”—fires, hurricanes, earthquakes and floods—gives us confidence that a communist society, based on solidarity, not charity, can build a new world. This murderous capitalist system must and will be defeated. When the masses, mobilized for communism and led by their Party, take power, we will face the devastation of capitalism and the aftermath of war. The centuries-long history of racist exploitation by the world’s imperialists means that conditions will be worse in some places than in others. We will fight against any lingering racism and individualism to make sure that everyone has the necessities of life. It will be a long struggle to provide decent food, shelter, and infrastructure for the masses, at the same time as we are fighting to extend workers’ power around the world. But eliminating the capitalist exploiters and organizing society based on need, not profit, will liberate the productive energies of the world’s workers. We’ll build the safest and strongest buildings possible, and organize to protect society from the natural disasters we cannot prevent. We’ll be organized to work together and take care of each other. We’ll have plans in place to respond collectively in the case of a hurricane or an earthquake. No one will be left on her/his own. Puerto Rico looks like a war zone. Much of the island is totally destroyed. All the infrastructure of capitalism has broken down. Workers are dying and the government is totally unable to function. What’s lacking for this to be a revolutionary situation is a communist party with a mass base and a plan. If the International Communist Workers’ Party had a concentration in Puerto Rico we would be organizing now for power. That’s our task—to build communism in the conditions of war and disaster. When workers can no longer survive capitalism, the urgent need to organize a society where we all survive together becomes clear. Puerto Rican workers have a history of militant class struggle, although often diverted by nationalism and reformism. In 1950 there were uprisings in Ponce, Utado, Naranito and Jayuyu—all part of a world-wide anti-imperialist upsurge against colonialism. 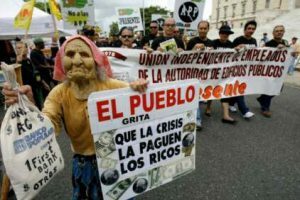 In 1998 Puerto Rico was shut down by a 48-hour general strike in support of telecommunications workers. Neither independence, statehood or trade unionism will solve the problems created by capitalism. Workers and soldiers must fight for communism. That potential scares the ruling class. Their fear helps explain the US bosses’ decision to send 17,000 soldiers to the island to stay until “all needs are met.” Although military jeeps and helicopters could take supplies to the most remote places, they are concentrated in the cities to control angry workers. Puerto Rican workers have fought for US imperialism in every major war since World War I. In fact, they were made citizens in order to draft them for WWI. They are fighting in US wars today in Iraq and Afghanistan. As the contradictions of capitalism intensify, world war seems closer and closer. Puerto Rican soldiers will be called to serve massively in the eventual WWIII. 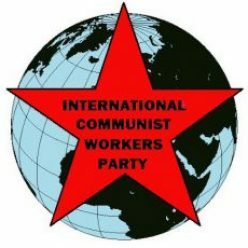 They, like all soldiers, should join ICWP to turn the guns around and fight for communism. Masses of people around the world are dying from the effects of capitalism and imperialism. When workers and soldiers are organized for communism, we can turn capitalist disasters like Hurricane Maria into opportunities for revolution. We have nothing to lose but our chains and a world to win. Puerto Rico is in the midst of a humanitarian crisis. This is a crisis of capitalism—and it calls out for a communist solution. This commonwealth of the US was devastated by Hurricane Maria which struck on Sept. 25, 2017. Puerto Rico, an island of 3,515 square miles, is one of the top drug producers in the world. Drug companies and device manufacturers started building plants there decades ago thanks to tax breaks and availability of skilled labor. The island is an important exporter of drugs. Pharmaceuticals are a $15 billion business, raking in super profits while workers earn poverty wages. Yet due to capitalism and its long legacy of colonialism, the working class is suffering under huge debt and weak infrastructure. While the pharmaceutical and medical supply companies make profits in the billions, Puerto Rico owes $70 billion in debt. This was engineered by laws passed by the U.S. Congress that inflated a massive manufacturing bubble in Puerto Rico, and then popped it. At the same time, Congress encouraged investors to buy the island’s debt, even when the territory’s economy was in distress. For decades, the federal government used tax breaks granting U.S. companies an exemption on all income originating from American territories if operating in Puerto Rico. This encouraged the island’s industrialization and kept companies in the US that didn’t want to pay taxes. By 2006, the exemptions were history and so was Puerto Rico’s manufacturing boom. The territory has been in recession ever since. But the island did see continued growth in one of its prime exports: debt. Mutual funds were still eager to buy Puerto Rican bonds, even as its economy languished. That’s because those bonds are “triple tax exempt,” which means their interest payments go untaxed by federal, state, and local governments. This is how capitalists exploit and blame the working class for their debt. While the factories survived the hurricane, schools, hospitals, and the homes of workers did not. Many workers in the pharmaceutical industry are unable to come to work due to the devastation to their homes and families. Puerto Ricans are going to see the death toll rise as critical water, fuel and electricity needs are not being met. The halt in production of drug and medical supplies will impact the rest of the US. FDA commissioner Scott Gottlieb testified this week that he’s very concerned about potential critical shortages. He said that there are 40 drugs that are made by 10 firms that they’re closely watching. By the end of October 2017, these shortages will start to be felt in the mainland US. When we think about humanitarian crises caused by natural disasters, it is really a capitalist crisis. Extracting more profits from exploiting the working class with the government and industries working together is the real cause of the crisis. But the crisis is also an opportunity to organize for a communist revolution and a world created by and for the working class.